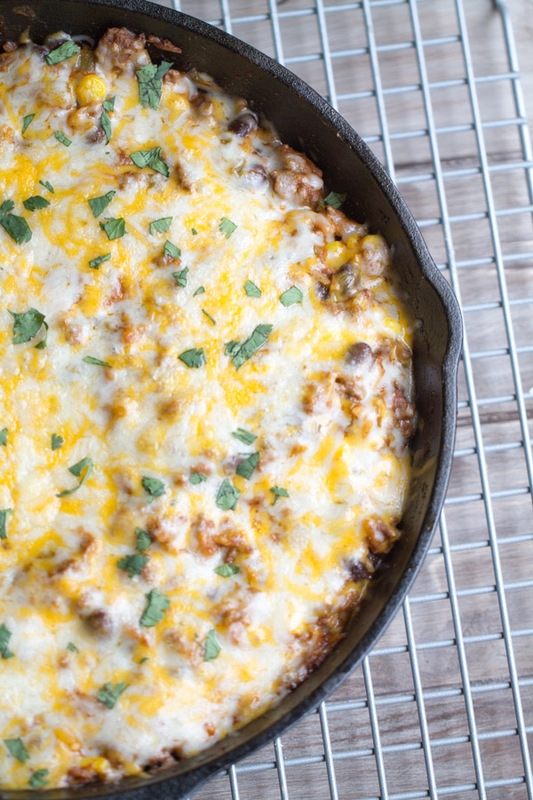 If you love Mexican food, you’re gonna want to grab a plate and a fork and dig into this Easy Skillet Beef Tex Mex Casserole. Lean ground beef is browned and then simmered with rice, enchilada sauce, taco seasoning and a little water. Mix in some light cream cheese, black beans, sweet corn, and diced green chilis. Top with shredded Mexican cheese and broil until the cheese is ooey gooey bubbly and slightly browned. BOOM! 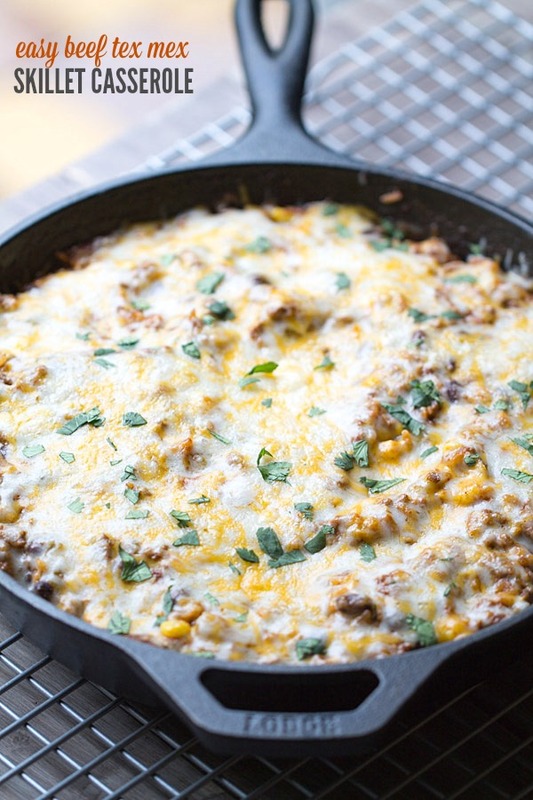 You’ve got yourself a darn good one skillet meal that the entire family will love! There’s hardly ever a time that I’ll turn down any Mexican food or Mexican inspired dish. In fact, I Mexican food often. Just ask some of the gals I work with. When we order takeout for lunch, 90% of the time my vote goes to Mexican food. My cravings were stronger than ever during my trip to Vegas. However, I was unable to satisfy them. Boo. Mediocre reviews of the Mexican restaurants within the vicinity of our hotel turned us away. No way were we going to pay an arm and a leg for mediocre food. In a 10 inch oven-safe skillet, cook the ground been over medium heat until browned (do not drain if you are using lean beef). Add the taco seasoning, enchilada sauce, water and rice. Mix well. Cover and simmer for 25-30 minutes or until the rice is tender. Some of the rice may stick to the bottom of your skillet. Just scrape it off the bottom with a spoon. Once the rice is done cooking, stir in the cream cheese. Add the corn, black beans and diced chilis. Mix well. Top with the shredded cheese. Broil for 3-5 minutes or until the cheese is melted and bubbly. Garnish with cilantro, if desired. HUNGRY FOR MORE SKILLET RECIPES? One Pot Taco Pasta by Damn Delicious. 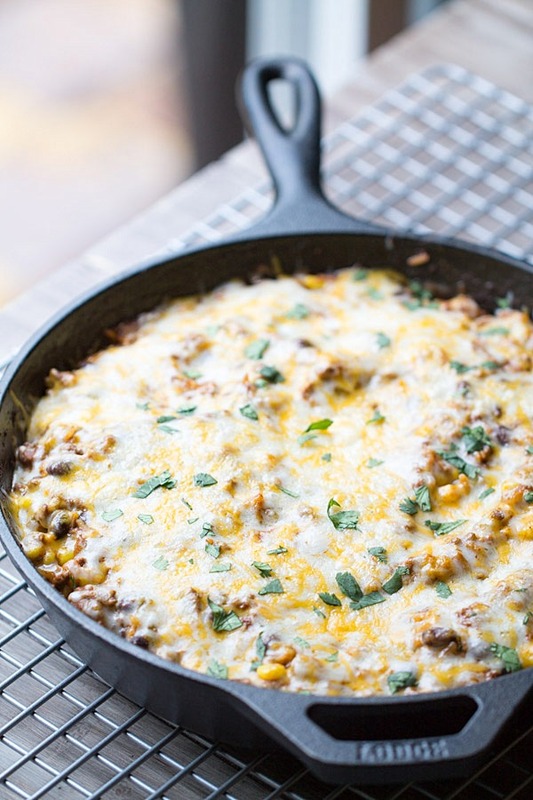 Easy One-Skillet Lasagna by I Heart Eating. Pasta Primavera Skillet by Will Cook for Smiles. 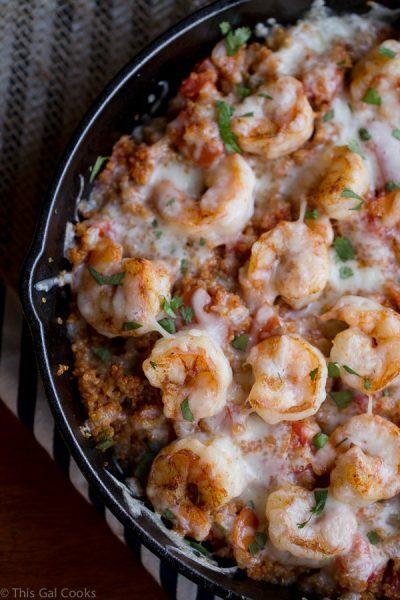 Try my Cajun Shrimp and Quinoa Casserole. Our kind of easy casserole, Julie, love this! Mmmm I love mexican food so this babe would be a major winner here (minus the beef heheheh) because SOOOOO MUCH CHEESE *-* I adore how easy to make it is too! You could totally sub the beef with lentils or extra beans! I actually may have to try it that way one day. Thanks for stopping by, Consuelo! I don’t ever turn down a good Mexican meal either, especially when it looks like this! The cheesssseeeee!! Omg. Cheese is always a huge win! Thanks so much for stopping by, Nicole! Oh Gosh… I love mexican food and skillet recipes!!! I also love all the ingredients in here. This dish is calling my name! This dish is still calling my name so I have to make it again STAT! Thanks for stopping by, Olivia! Julie, this looks like an easy and tasty weeknight dinner. I’m pinning it for next week. Oh holy cow, Julie. Now you KNOW how much I want to face plant right into this skillet… pinning and looks like it’s Mexican (again) tonight!! YUM!!! LOL, now that might get a little messy, Claire! I’m ALWAYS craving Mexican. Seriously, I could eat it every day for the rest of my life. Thanks so much for stopping by! I love these skillets, we go camping on the weekend and there is nothing better. Especially when you are cooking for three families. Yes! The skillet meals are perfect for camping and for serving larger groups of people. Thanks for stopping by! Skillet meals FTW! You really packed everything in here, but yet, it doesn’t take all afternoon! I love it when people add cream cheese to Mexican food – some rich creaminess without a distinctive cheese taste. I’m with Claire, can we all just faceplant in this awesomeness? Pinning! This looks AMAZING. Dinner for tomorrow is officially planned. BOOM. Yeah! So happy you enjoyed this recipe, Francesca! I love mexican food and this dish looks so good. Can’t wait to give this a try always looking for new mexican recipes. I hope you enjoy the recipe, Kristen! Thank you so much for stopping by. Love skillet dinners!! This one looks delish! Thanks for linking up at Saturday Night Fever!! When I read comments about recipes, all I see are post after post about how “good” it “looks”, when what matters most is how it turned out for the reader. SO, I vow to do my part and leave comments on how a recipe turned out after I made it. I made this to today to take for my work lunches for the rest of the week and it turned out amazing!! I followed the recipe almost to a T, but I did make some changes…less beans, less green chilies and lots more corn. I’m actually looking forward to work tomorrow so I can eat my lunch! Loved this one pot meal for our family of 5. I was out of black beans and used Great Northern which tasted great. Love the crispness of the frozen corn. Next time I might add a little extra. We used sour cream on top. My teenage son sugfested we try serving this dish with tortilla chips next time which I think would be yummy. Instead of canned enchilada sauce, I made this enchilada sauce which comes together quickly while the beef is browning. I’ve made it many times. It has a great flavor and is more affordable than canned. Thanks for a great dish!